As the charming main street of historic Downtown McMinnville, Oregon, Third Street offers a quintessential small-town experience. There are a variety of shops, restaurants, and other services that help to create a robust, mixed-use, holistic streetscape. 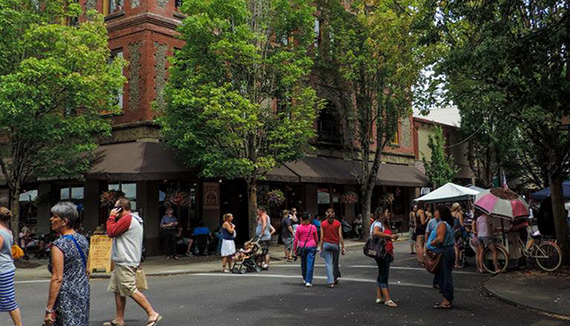 Third Street welcomes residents and visitors of all ages, and is the host of year round activity that Downtown McMinnville has been recognized for. Six-block stretch from McMinnville City Park to the railroad tracks just past Galloway Street on East Side. Huge trees along the sides of Third Streel delineate the area and make it stand out from other parts of McMinnville. The trees were carefully selected and planted as part of a major streetscape in the early 2000's. Huge trees along the sides of Third Street delineate the area and make it stand out from other parts of McMinnville. The trees were carefully selected and planted as part of a major streetscaping in the early 2000s. Photo McMinnville Downtown Association. 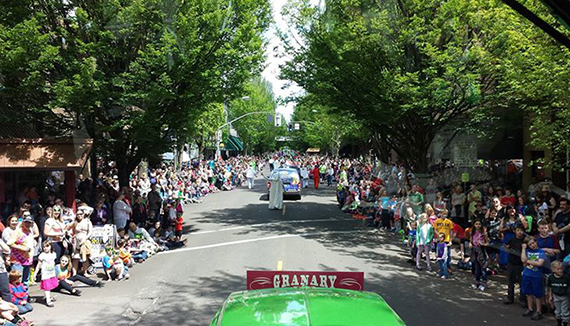 Many events throughout the year attract visitors to Third Street whether they participate in a historic open house and tour, attend a brown bag concert in the summertime, or shop for some local produce at the McMinnville Farmers' Market. The street has been at the heart of creating a strong sense of community in the epicenter of downtown's historic and cozy aesthetic. Thoughtful planning has brought a pedestrian focus to Third Street. In the early 2000s, a streetscape project was spearheaded as a part of a downtown improvement plan. Since then, it has been developed as a destination street and features many buildings listed on the National Register of Historic Places that have been transformed to accommodate modern uses and needs. Historic buildings dominate Third Street, including the old Hotel Oregon. The building has been redeveloped for new uses, as have many old banks, offices, and warehouses. Photo McMinnville Downtown Association. Third Street is a vibrant and beautiful street that is the product of historic preservation and a multi-faceted streetscape plan. The six-block stretch from McMinnville City Park to the railroad tracks east of Galloway Street is an enchanting thoroughfare featuring huge trees that make it truly unique to the area. More than 50 buildings along Third Street are classified by the City of McMinnville as having historical significance to the city's history, architecture, or setting. Such buildings include iconic places that are now used for more modern purposes. One example is the 1905 McMenamins Hotel Oregon, which has been home to a restaurant, Western Union, bus depot, and other uses. Third Street became a destination street as a direct result of the 2000 Downtown Improvement Plan and subsequent Third Street Streetscape Plan (published in 2005). These plans called for the city to build pedestrian infrastructure, create traffic calming measures, add better lighting, and take other measures to make it a Complete Street. At the McMinnville Farmers' Market visitors can find fresh produce, live music, arts and crafts, and wine tasting on Thursdays from late May through early October, on Cowls Street between Second and Third Streets. Third Saturday Art and Wine Walk takes place on every third Saturday, year round. 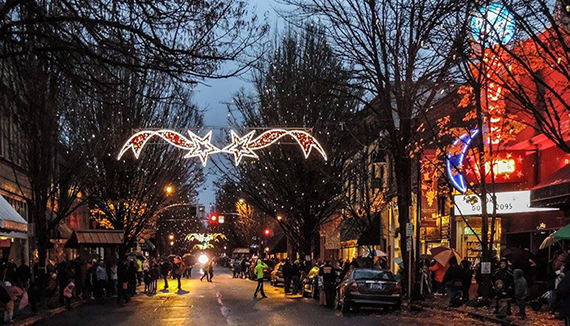 McMinnville often dresses up Third Street to celebrate the holidays. As the main downtown drag, it gives the city a prime location to decorate for different events. Photo McMinnville Downtown Association. In 2013, McMinnville developed and created an urban renewal district, part of which is located in downtown McMinnville. Within this newly established district, the city plans to "design and construct streetscape improvements to Third Street ... [and] implement various streetscape and design improvements through the district to establish a high quality and unique aesthetic."